Prince was born and raised in Minneapolis, Minnesota, and developed an interest in music as a young child; he wrote his first song, "Funk Machine", at the age of seven. He signed a recording contract with Warner Bros. Records at the age of 17, and released his debut album For You in 1978. His 1979 album Prince went platinum, and his next three albums���Dirty Mind (1980), Controversy (1981), and 1999 (1982)—continued his success, showcasing his prominently explicit lyrics and blending of funk, dance, and rock music. In 1984, he began referring to his backup band as The Revolution and released Purple Rain, the soundtrack album to his film debut. It quickly became his most critically and commercially successful release, spending 24 consecutive weeks atop the Billboard 200 and selling over 20 million copies worldwide. 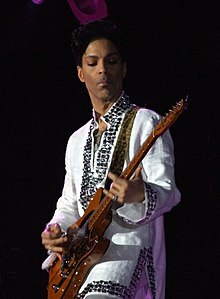 After releasing the albums Around the World in a Day (1985) and Parade (1986), The Revolution disbanded, and Prince released the double album Sign o' the Times (1987) as a solo artist. He released three more solo albums before debuting The New Power Generation band in 1991. Prince's innovative music integrated a wide variety of styles, including funk, rock, R&B, new wave, soul, psychedelia, and pop. He has sold over 100 million records worldwide, making him one of the best-selling music artists of all time. He won seven Grammy Awards, six American Music Awards, a Golden Globe Award, and an Academy Award for the 1984 film Purple Rain. 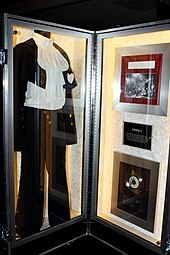 He was inducted into the Rock and Roll Hall of Fame in 2004. Rolling Stone ranked Prince at number 27 on their list of 100 Greatest Artists of All Time. The next album intended for release was The Black Album. 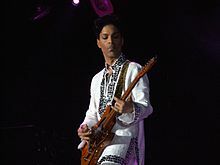 More instrumental and funk- and R&B-themed than recent releases, The Black Album also saw Prince experiment with hip hop on the songs "Bob George" and "Dead on It". Prince was set to release the album with a monochromatic black cover with only the catalog number printed, but after 500,000 copies had been pressed, Prince had a spiritual epiphany that the album was evil and had it recalled. It was later released by Warner Bros. as a limited edition album in 1994. 1991 marked the debut of Prince's new band, the New Power Generation. 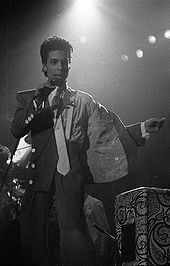 With guitarist Miko Weaver and long-time keyboardist Doctor Fink gone, Prince added bass player Sonny T., Tommy Barbarella on keyboards, and a brass section known as the Hornheads to go along with Levi Seacer (taking over on guitar), Rosie Gaines, Michael Bland, and the Game Boyz. With significant input from his band members, Diamonds and Pearls was released on October 1, 1991. Reaching No. 3 on the Billboard 200 album chart, Diamonds and Pearls saw four hit singles released in the United States. "Gett Off" peaked at No. 21 on the Hot 100 and No. 6 on the R&B charts, followed by "Cream", which gave Prince his fifth US No. 1 single. The title track "Diamonds and Pearls" became the album's third single, reaching No. 3 on the Hot 100 and the top spot on the R&B charts. "Money Don't Matter 2 Night" peaked at No. 23 and No. 14 on the Hot 100 and R&B charts respectively. Following an autopsy, his remains were cremated. On April 26, 2016, Prince's sister and only full sibling Tyka Nelson filed court documents in Carver County, to open a probate case, stating that no will had been found. Prince's five half-siblings also have a claim to his estate, which totals millions of dollars and includes real estate, stocks, and cars. As of three weeks after his death, 700 people claimed to be half-siblings or descendants. Bremer Trust was given temporary control of his estate, had his vault drilled open, and was authorized to obtain a blood sample for DNA profiling. Numerous musicians and cultural figures reacted to Prince's death. President Barack Obama mourned him, and the United States Senate passed a resolution praising his achievements "as a musician, composer, innovator, and cultural icon". Cities across the US held tributes and vigils, and lit buildings, bridges, and other venues in purple. In the first five hours after the media reported his death, "Prince" was the top trending term on Twitter, and Facebook had 61 million Prince-related interactions. MTV interrupted its programming to air a marathon of Prince music videos and Purple Rain. AMC Theatres and Carmike Cinemas screened Purple Rain in select theaters over the following week. Saturday Night Live aired an episode in his honor titled "Goodnight, Sweet Prince", featuring his performances from the show. The Los Angeles Times called Prince "our first post-everything pop star, defying easy categories of race, genre and commercial appeal." Jon Pareles of The New York Times described him as "a master architect of funk, rock, R&B and pop", and highlighted his ability to defy labels. Los Angeles Times writer Randall Roberts called Prince "among the most versatile and restlessly experimental pop artists of our time," writing that his "early work connected disco and synthetic funk [while his] fruitful mid-period merged rock, soul, R&B and synth-pop." Simon Reynolds called him a "pop polymath, flitting between funkadelia, acid rock, deep soul, schmaltz—often within the same song". AllMusic wrote that, "With each album he released, Prince showed remarkable stylistic growth and musical diversity, constantly experimenting with different sounds, textures, and genres [...] no other contemporary artist blended so many diverse styles into a cohesive whole." Rolling Stone ranked Prince at number 27 on its list of 100 Greatest Artists, "the most influential artists of the rock & roll era". Prince was known for the strong female presence in his bands and his support for women in the music industry throughout his career. Slate said he worked with an "astounding range of female stars" and "promised a world where men and women looked and acted like each other." 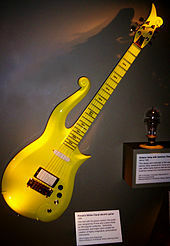 Prince's music synthesized a wide variety of influences, and drew inspiration from a range of musicians, including James Brown, George Clinton, Joni Mitchell, Duke Ellington, Jimi Hendrix, the Beatles, Chuck Berry, David Bowie, Earth, Wind & Fire, Mick Jagger, Rick James, Jerry Lee Lewis, Little Richard, Curtis Mayfield, Elvis Presley, Todd Rundgren, Carlos Santana, Sly Stone, Jackie Wilson, and Stevie Wonder. Prince has been compared with jazz great Miles Davis in regard to the artistic changes throughout his career. Davis said he regarded Prince as an otherworldly blend of James Brown, Jimi Hendrix, Marvin Gaye, Sly Stone, Little Richard, Duke Ellington, and Charlie Chaplin. Prince and Miles Davis performed together for a Charity Event at Paisley Park. This performance was viewed as the pinnacle of their on-again, off-again partnership. Prince was romantically linked with many celebrities over the years, including Kim Basinger, Madonna, Vanity, Sheila E., Carmen Electra, Susanna Hoffs, Anna Fantastic, Sherilyn Fenn, and Susan Moonsie. He was engaged to Susannah Melvoin in 1985. In 1990, he met 16-year-old Mayte Garcia backstage in Barcelona after he saw a tape of her dancing. After graduating high school, she began working as one of his backup singers and dancers. When she was 19, he instructed her to get on birth control, thus beginning their sexual relationship. They were married on February 14, 1996; he was 37 and she was 22. They had a son named Amiir Nelson, who was born on October 16, 1996, and died a week later on October 23 after suffering from Pfeiffer syndrome. The distress of losing a child and a subsequent miscarriage took a toll on the marriage, and the couple divorced in 2000. In 2001, Prince married Manuela Testolini in a private ceremony. They separated in 2005 and divorced in May 2006. ^ Campbell, Michael (2008). Popular Music in America: The Beat Goes On. Cengage Learning, 2008. p. 300. ISBN 0495505307.